Shelby American admitted that the photos of the Shelby 1000 showing its front wheels lifting off the ground were “accidently” released to the press. When Shelby announced it will reveal a 1000 horsepower limited production Shelby 1000 Mustang at the New York International Auto Show, everyone new this was going to be a special car. Any production car with that much horsepower to the rear wheels will be challenging for even the most seasoned driver to keep all four wheels on the ground. 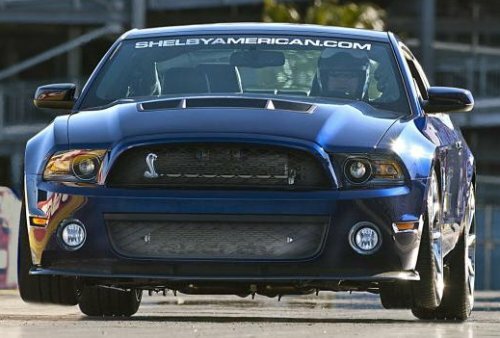 But as reported by USA Today, the photos of the Shelby 1000 lifting it’s front end off the ground are fakes. John Luft, CEO of Carroll Shelby's Las Vegas-based aftermarket outfit, issued a statement saying the "photos of the Shelby 1000 were edited tongue-in-cheek to inspire those at Shelby American who had worked so hard to develop the car" and that "images were not supposed to be used outside of the company." But if the photos were meant to be kept in-house, why did Shelby American leak the photos to the press? USA Today says, “two of the photos were distributed to the press as part of a group of shots and were being used on many websites.” Many questioned the authenticity of the photos, especially since the Mustang is a street legal car with street tires, not drag slicks. Even though the new Shelby 1000 won’t be able to lift its front wheels off the ground in the real world, it’s still an impressive car. The street legal Shelby 1000 will pump out an estimated 950 horsepower straight from the factory. And a track version S/C version can be ordered that will have a mind-numbing 1,100 horsepower under the hood. Mustang Daily reports the new Shelby 1000 starts with a 2012 Shelby GT500 platform and the 5.4-liter V-8 gets stripped of the factory internals and gets new pistons, crankshaft and connecting rods to handle the rest of the goodies that get added. The Shelby 1000 gets new heads, a larger supercharger and extra cooling capacity and then tuned to Shelby specifications. The factory suspension won’t handle all that horsepower, so it gets reworked with a solid driveshaft and a new nine-inch rear end. Shelby also added bigger brakes to ensure that the car can stop from warp speeds. For anyone who interested in this limited production Shelby, orders will be taken once it’s unveiled next week. But come prepared to open up your wallet because a fully completed Shelby 1000 will have a sticker price in excess of $200,000 fully optioned. Look for the limited-production Shelby 1000 to debut at next week's New York Auto Show on April 5th. What, you couldn't tell at first glance that this photo was a fake? Take a look at the front wheels... Suspension is still compressed. Typically that wouldn't be the case, if the front wheels are OFF THE GROUND.